Erin is a professional graphic designer with eight years of experience, having graduated from the College of North Atlantic's Graphic Design program in 2004. She has worked for companies such as Random House of Canada, Breakwater Books, Granite Studios, and Salvation Army. In addition to her graphic design work, she does her own projects such as a one-issue comic that she did about global warming (which is actually funnier than you would think). 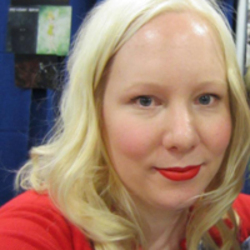 As well, with Toronto Joker she sells prints of her own works at comic and art conventions around the GTA. Currently she is working on getting her B.A. in English and Psychology through the distance program from Memorial University.